Francis Quirk Master Painter Blog: Francis J. Quirk Painter and TV-Star! While seeking information on Francis Quirk and his time in Provincetown, we came upon this article in an issue of the October 22, 1957 issue of the Reading Eagle. 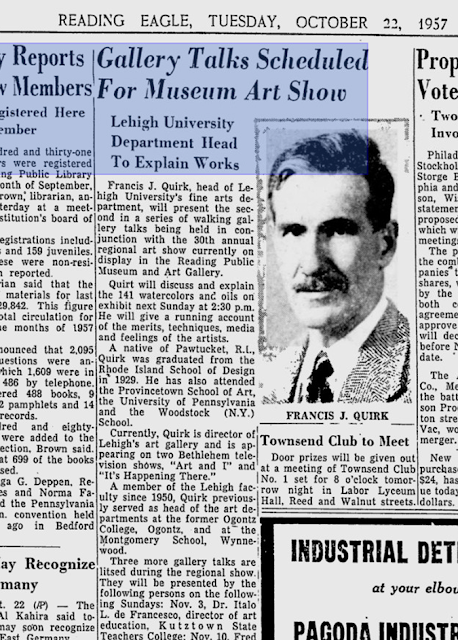 The piece discusses an upcoming gallery talk at the Reading Public Museum and Art Gallery. The article also mentions that the dashingly photographed Quirk is active in two Bethlehem television shows- "Art and I" and "It's Happening There." I believe the programs were broadcast on WFIG, a Bethlehem, Pennsylvania TV station which is now longer operational under those call letters. The 1950's was the early days of television when they were hungry for content. The program may have even been broadcast live so tapes may not exist. It may be time to reach out and/or visit Lehigh University to see what they have. Alas, so many leads, so little time. Article on Francis Quirk Gallery Talk Mentioning His Involvement in Two TV Shows.